If I am being investigated for a federal crime, what is the process that will be followed in Michigan? Federal criminal charges generally start with a sworn statement (called a complaint) presented to a U.S. Magistrate Judge. The complaint may be issued by the United States Attorney’s Office either before or after you have been arrested. The magistrate determines whether there is probable cause to believe that an offense has been committed and that you committed it. If you have not already been arrested, a warrant for your arrest will be issued if the judge determines there is probable cause. If you do not already have a lawyer, it is critical to have one at this stage in the proceedings. 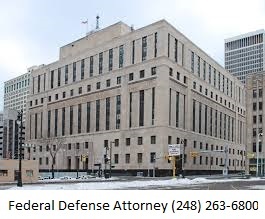 You do not want to appear to any court hearing or any meeting with law enforcement without a highly experienced federal defense lawyer by your side and protecting you all the way! After your arrest, the officer making the arrest is required to take you before the nearest available magistrate judge without unnecessary delay. This may mean that you will spend some time in the county jail where you are arrested and will be transported by the U.S. Marshal’s service to be before the magistrate in a few days or so. Once you appear before the magistrate, he or she will inform you of the charges, your right to counsel, and your right to request the appointment of an attorney, if you qualify financially. At this hearing, you will not be required to answer questions about the charges against you. You will be entitled to a detention hearing (bail hearing). That is usually held within 5 days of your first federal court appearance. Both the prosecution and the defense may request a later hearing date under certain circumstances. At this hearing the magistrate will determine whether, under the facts of your case, you will be released prior to trial. If you are released, you may be required to deposit a cash bail or purchase a bond in order to secure your release. You attorney can give you recommendations on how to accomplish this. Your release conditions may also stipulate that you must provide urine samples, surrender your passport, and comply with restrictions on your travel or residence. The court may set many other conditions. Some forms of release require you to wear electronic or satellite (GPS) tracking equipment. This will be in the form of an ankle bracelet or transmitter. Other forms of release may require you to check in daily with a probation officer. Most people charged in federal court are released on an unsecured bond that does not require any money to be posted. An experienced federal defense lawyer gives you the best chance of not being detained. At some point in the process, either before your arrest or within a few weeks of arrest, the prosecutor will present your case to a grand jury. Neither you nor your attorney usually will be present. If the grand jury decides that there is enough evidence against you to justify charging you with a crime, then the grand jury will issue a formal charging document, called an indictment, stating the exact charges against you. In some cases, it is appropriate to waive your right to indictment and permit the government to file an Information against you. An Information also is a formal charging document. It has the same effect as an indictment. The filing of an information bypasses the grand jury process. If waiver of indictment is an option in your case, your attorney will discuss it with you. On an indictment, you will be scheduled for an arraignment before a U.S. Magistrate Judge. This occurs in Detroit, Michigan in the federal courthouse. At the arraignment, your charges are read to you. At that time, you will be required to enter a plea of guilty or not guilty to the charges against you. You will be advised of your rights. If the case is a felony charge and your arraignment is before a U.S. Magistrate Judge, you usually will be required to enter a plea of not guilty even if you have already entered into a plea agreement. No evidence will be taken at this time. Shortly after this, the court will set dates for motions to be filed and for evidence to be disclosed, and a date for your case to be tried. Your attorney will advise you of your rights and options. From this point on, your attorney will be gathering the facts and considering the law necessary to advise you of the strength of the prosecutor’s case. He or she will be determining any defenses you may have, the possible sentence you may face, and whether the attorney feels your interests are better served by a trial or a plea bargain. Each case is different. Complicated cases take more time to investigate, evaluate, and prepare for trial than do simple cases. Your attorney will be doing whatever is necessary to prepare your case as quickly as possible. Remember: complete investigation may take several months. Taking the time necessary to properly prepare your case may save you years in prison. Time spent at this stage of the proceedings, even if you are in pretrial confinement, is worth it. The main point to remember is that your Michigan Criminal Defense Attorney can best advise you only after your case is fully investigated and after determining what level of punishment the government is seeking. Preparation is the key to the proper resolution of your case. Your attorney may have the assistance of an investigator, a paralegal, or both in the preparation of your case. It often will be necessary for the investigator or paralegal to meet with you to help prepare your defense. What you tell your lawyer’s investigator will be confidential just as if you were talking with your attorney. Your attorney, your investigator, and your paralegal need to know the truth, even if the truth makes you appear to be guilty. If we know the truth, we can avoid being surprised at trial. You and your family can help in our investigation of your case by giving us the names and addresses of witnesses who can testify for you and provide an accurate explanation of what happened. Do not contact witnesses who will be called to testify against you. Do not get anyone to give a written statement without the direction of your lawyer. Federal law provides limited access to the government’s evidence against you. In some cases, the prosecutor may provide more information than the law requires and make available the entire discovery file for review. In such cases, your attorney can review all evidence, testimony and investigative reports relevant to your case that are in the government’s possession. In other cases, the prosecutor may limit access only to those materials that, under the law, must be made available to the defense. In either event, only your attorney will have direct access to the government’s discovery file. Your attorney will work closely with you to make sure that you know, and understand, what evidence is contained in the government’s file. The rules of discovery must be strictly adhered to. Your attorney will discuss these rules with you as your case progresses. Your attorney also will communicate with the prosecutor to try to get an idea of the government’s view of your case. At different points, your attorney may file motions, which may be heard by the court before or at trial. To best represent you, your attorney must be involved in all matters before the court. You should never file your own motions without fully discussing the proper procedures and contents with your attorney. If you have ideas about motions that might be filed in your case, you should discuss with your attorney whether those particular motions would be beneficial to your defense. The U.S. Constitution guarantees your right to a trial by jury. Any decisions to plead guilty, accept a plea agreement, waive trial by jury or any other decision to give up any constitutional right is exclusively yours to make. Your attorney will fully advise you as to your options and the benefit or risk of each option. Your attorney will give you his or her recommendation as to the decision that is in your best interest. However, the final decision is yours, and yours alone, to make. Your attorney will review with you any proposed plea agreements. You should understand that people who plead guilty as compared with those who are found guilty of the same crime at trial do not necessarily receive the same sentence under the federal sentencing guidelines. The law provides that, unless exceptions are granted by the court, you will be tried no earlier than 30 days or later than 70 days after your first federal court appearance. Actually, however, there are many things that can extend the 70-day speedy trial limit. In fact, adjournments to give the lawyers time to prepare are extremely common. Your case will be tried by a jury of 12 people unless you waive jury trial. First, the prospective jurors are selected and sworn. Then each side makes an opening statement to describe what the case is about. After the statements, the prosecutor (Assistant U.S. Attorney or AUSA) presents the government’s witnesses and evidence. You have the right to have your attorney cross-examine every witness presented against you. The government has the burden of proving your guilt beyond a reasonable doubt. Hopefully, if you go to trial you will be acquitted and sentencing will not be an issue. The court will schedule a sentencing hearing if you have been found guilty. Prior to the hearing, the court will order that the U.S. Probation Office prepares a Presentence Investigation Report (PSR). Sentencing guidelines, which are law, will be used to determine your sentence. Under the guidelines, the severity of the offense and the extent of your criminal history will largely dictate the sentence you receive. In some cases, your criminal history alone may be the key factor. Federal law mandates severe sentences for persons with certain types of prior convictions. As you can see, your criminal record may play a significant role in your decision to plead guilty or go to trial. Your sentence also will depend, in part, on whether your decision was to plead guilty or go to trial. The decision to plead guilty or go to trial is a critical decision in your case. You must discuss the application of the guidelines with your attorney to ensure that your decision is fully informed. In federal court, most people found guilty are jailed as part of their sentence. While probation is an option in some cases, probation alone is rare. In many cases probation is not an option the judge can consider. The harshest sentence you can receive upon conviction (aside from the death penalty that is applicable to certain federal crimes) will be an order sentencing you to confinement in a federal prison, which is controlled by the U.S. Bureau of Prisons (B.O.P.). You could be placed in any institution in the U.S. While the B.O.P. tries to place most people as close to their home state as possible, many factors are involved in assigning the place of confinement. Such factors include the offense of conviction, your prior record, and the length of sentence. Generally in the Southeastern District, if you are convicted or plead guilty and sentenced to prison time, you will be permitted to turn yourself into B.O.P. rather than being taken into custody. If you are convicted, even if you pled guilty, you have the right to appeal your case. A notice of appeal must be filed within 10 days after judgment (your sentencing order) is entered, or you lose that right. An appeal is an opportunity to tell the appellate court (the 8th Circuit Court of Appeals) exactly how the judge did not follow the law, or what rights you were denied. Typically, an appeal will take 6 months to a year to be decided. While your case is on appeal, it is unlikely that you will be released. You do not have an automatic right to bail while appealing. The 10-day time period allowed for filing a notice of appeal is critical. You must inform your attorney immediately after sentencing if you wish to appeal. If you are charged with or being accused of a federal criminal offense, please call LEWIS & DICKSTEIN, P.L.L.C. at (248) 263-6800 for a free consultation or fill out a Request for Assistance Form and an experienced federal criminal lawyer will promptly contact you. The federal criminal lawyers with LEWIS & DICKSTEIN, P.L.L.C. are dedicated to the passionate, fearless and tireless defense of those charged with federal offenses. We will find a way to help you and, most importantly, we are not afraid to win!